After an exciting final match with Mexico, the USA has emerged as the winner of the last regional IC Junior Challenge held in The Bahamas. There was a great final day match between Renata Zarazua of Mexico and Ursue Arconanad (USA) which Ursue won after saving match points. 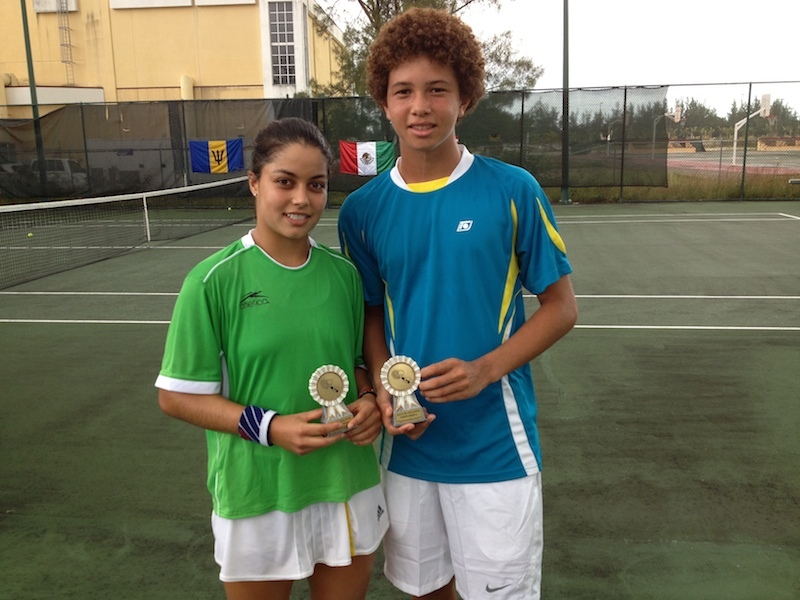 Both are top 100 ranked 18 & under juniors although still 16 & under. The USA will join Japan, Argentina, Italy, South Africa and host Great Britain in the worldwide finals at Wimbledon in the last week of July 2014. In second place was Mexico, with Barbados third and The Bahamas fourth. Throughout the event there was an excellent display of tennis and good sportsmanship in the IC tradition of “hands across the net, friendship across the ocean”. A successful mini tennis clinic was held for underprivileged children in which junior participants acted as coaches and seemed to enjoy as much as the participants. It even ended with the Barbados and USA junior “coaches” deciding they wanted to challenge each other to their own mini tennis match! First, thank you for your warm welcome to us. The weather was beautiful and we saw some big landmarks as soon as we got there from the Bahamian team captain. Everyone at the hotel was very nice and welcoming as well. I thought that the tournament was well organized and there was great competition. I also thought that it was a cool and fun experience to ride on the back of the truck back from the tennis center. I also thought it was great how we got to coach at the clinic and teach the little kids. I think I learned just as much as they did. It felt great to give back to the community and bring a smile to the kids’ faces. I just wanted to thank you for giving us the opportunity to compete in the IC championship and for being so welcoming. Experiencing the Bahamian atmosphere for the first time was impelling. The clear blue waters, friendly people, and captivating culture, really made the trip wonderful. It wasn't just great experiencing the trip by myself, but with a team, my friends. 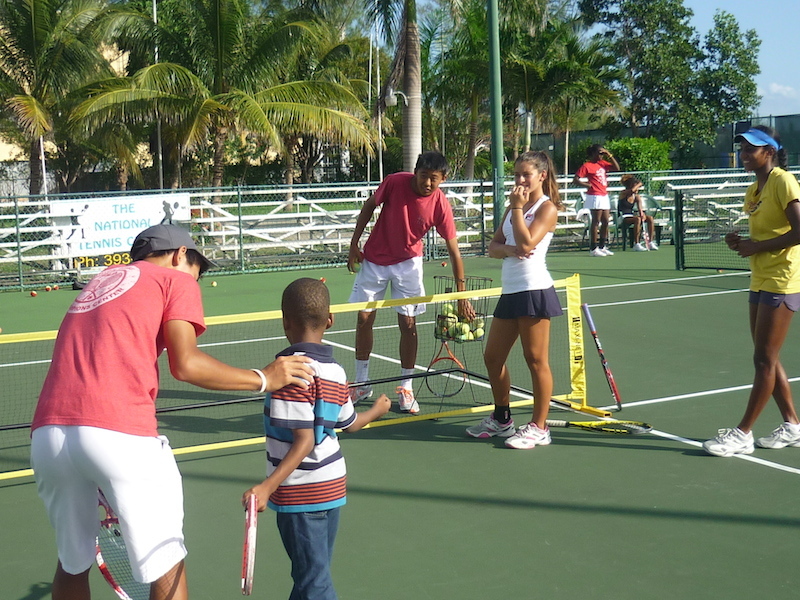 We all had a great time roaming the Bahamian streets, hanging with friends, and playing tennis. The team dinners each night was a good time to meet new friends and bond with other teams. Enduring Bahamas made me realize the things I have taken granted of. For example, not leaving one ball on the court, because some people don't have the resources to provide many balls to tennis centers. Leaving balls on the court was common at my tennis center, since our center had a lot of balls. This small little task has made me aware of the importance of each tennis ball. Teaching younger kids to play tennis wasn't new to me, but learning how hard it is to make kids listen was. I respect the efforts of all coaches now because I know how hard it can be for them at times. The most important thing I learned from the team competition was that a team is measured by the trust among the teammates. The competition of tennis was intense and also fun. Competing in a team is completely different than competing individually because the pressure is immense on a team. There isn't a worser feeling than letting team members down; however, there isn't a better feeling than sharing success with team members. Supporting team members and having other teams support each other is really neat too. Making new friends came handy because I gained that much more support from them. Representing a country makes me feel proud of my tennis and accomplished of what I've done in my young career so far. The first day of Bahamas, it was almost like we had two teams representing USA: the boys and the girls. As time passed, the bonds became stronger and so did our trust among each other. By the last match, we were competing as one team which gave us a huge advantage to the opposing team. I believe that the trust among our team put us in a great position to succeed. I could not be more grateful for the sponsors and people who organized this competition to accommodate each teams' desires. The smoothly run trip was the best trip I have had thus far and one of the most learned trips I have had thus far. I wanted to take the time to let you know how thankful I am for giving me the opportunity to play the IC Challenge in the Bahamas this year. As excited as I was to have won the tournament with my teammates, I had a great experience off the tennis court as well. I loved everything that the Bahamas had to offer, especially the beautiful beaches and not to mention the great food! This was my first time playing Fed Cup so it was extremely exciting to not only play for myself but to play for my teammates and the United States. I made a lot of new friends and created memories that I will take with me forever. I can't thank you enough for making the tournament as special as it was. Looking forward to having another great trip to London next year! Thank you for organizing the whole trip to Bahamas. I had a great experience and lots of fun, on and off the court. I am really looking forward to going to England and playing more tennis! 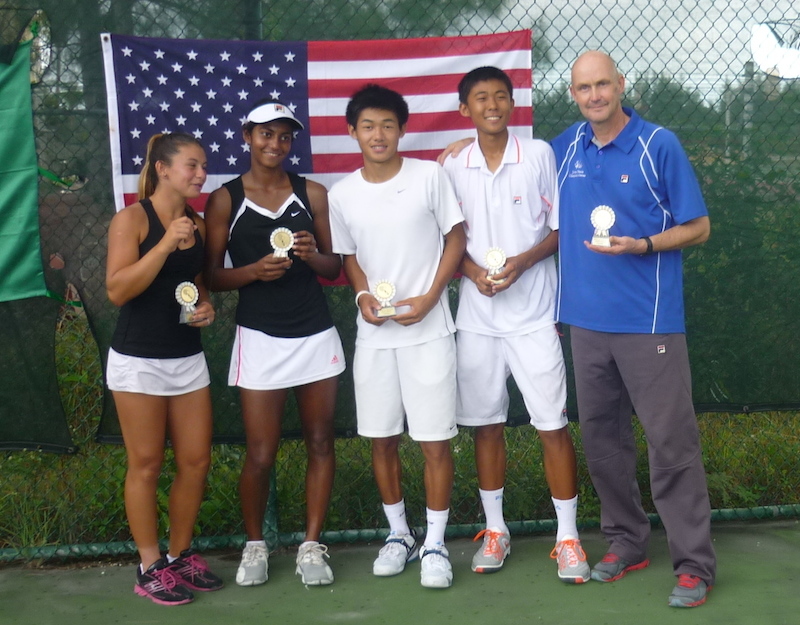 This weekend starting at 9.30 am on Saturday, Sunday and Monday at The National Tennis Centre juniors in the world top 100 will be compete in The IC North American Junior Team Challenge. This is for a place in the Worldwide Finals on the grass of Wimbledon next July. 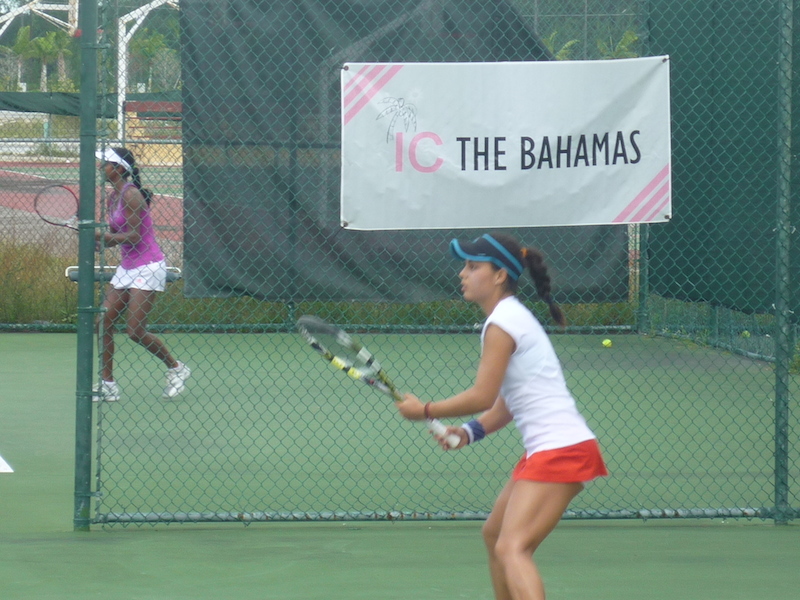 It is probably the strongest group of juniors to be seen in The Bahamas for many years. Our own Bahamas team will be up against them and It should be a great experience. Spectators are welcome and there is no charge. On the USA team is Francis Tiafoe currently ranked at 38 in the World’s top 18 & under juniors although this is a 16 & under event. Also on the USA team is Usue Arconda ranked at 88 in the world rankings. Strong competition will come from Mexico where their top girl player Renata Zarazua is ranked at 75th and their number two girl Constanza Gorches is ranked at 182. When the year closes all these players will still be 18 & under juniors and should move in to the top 50 and higher. These teams will be joined by our Bahamas team and Barbados. The format is where all boys and girls play both a singles and a doubles match against every other country. All results being combined in to one team result. The Bahamas team has been training under the supervision of Sandy Reid and Adult Captain Neil Mactaggart and have also played trial matches. In this group are Joshua Turnquest, Shannon Francis, Dylan Walker, Iesha Shepherd, Gabriela Donaldson, River Hart and Shay Missick from Freeport. 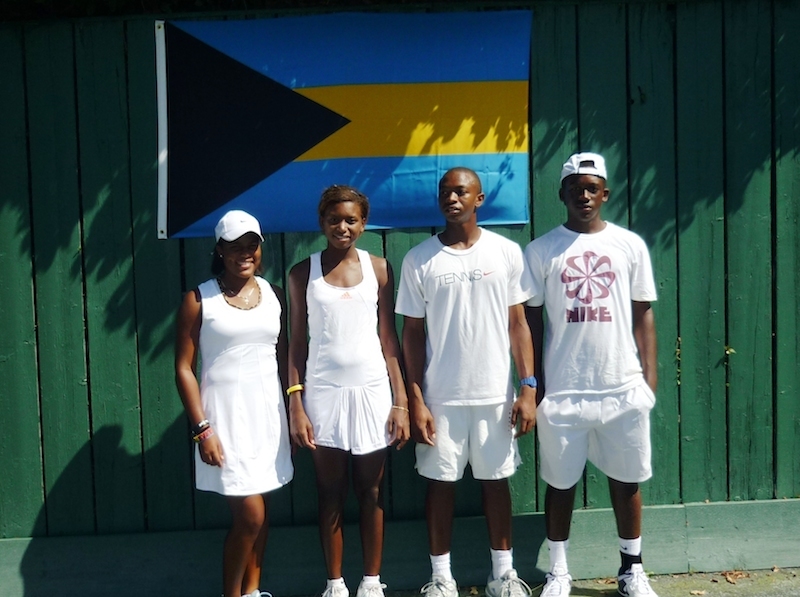 On the Bahamas team for the opening matches are Shannon Francis, Iesha Shepherd, Joshua Turnquest and Gabriela Donaldson. IC President Kit Spencer said “ This is probably the highest level of junior play we will have seen in this country for many years. 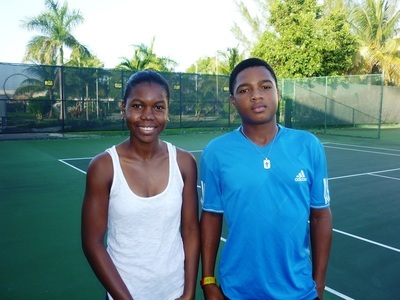 It is a great experience for our young Bahamian team many of who are still 14 & under and will be eligible for the next competition in two years time. Our IC motto is Hands across the net, friendship across the nation”. By sponsoring theses events at no cost to the juniors we hope to give them a great experience of team play that our IC members around the world have enjoyed in events such as The Davis Cup. For more information contact Kit Spencer 363-2930 or Neil Mactaggart 359-0900 or go to the IC Council website www.ictennis.net.